Edmonton housing starts saw a reduction due to significantly lower single-family housing production. Edmonton broke ground on a total of 1,616 housing units in Q1 2019, representing a decline of 7.1 percent year-over-year from 1,739 units in Q1 2018. 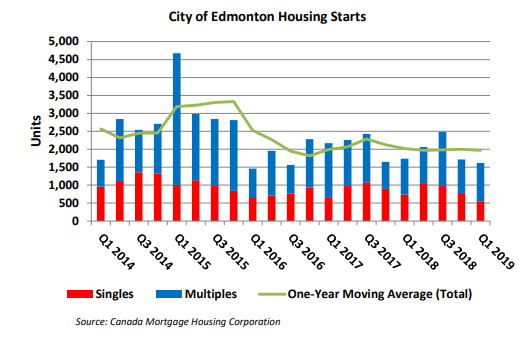 The one-year moving average for total housing starts in Edmonton saw a marginal reduction in Q1 2019 from the previous quarter, solely driven by the single-family segment. The one-year moving average is helpful to filter out quarter-over-quarter fluctuations which may be due to seasonal factors. On a year-over-year basis, total housing starts were 7.1 percent lower in Q1 2019. The reduction was due to single-family starts which saw a significant decline of 25.2 percent year-over-year in Q1 2019. The decline in the single-family segment more than offset a 6.3 percent year-over-year gain in multi-family starts, which include semi-detached, row and apartment starts. The gain in multi-family starts was solely driven by higher apartment starts which more than doubled the number of starts recorded in Q1 2018. 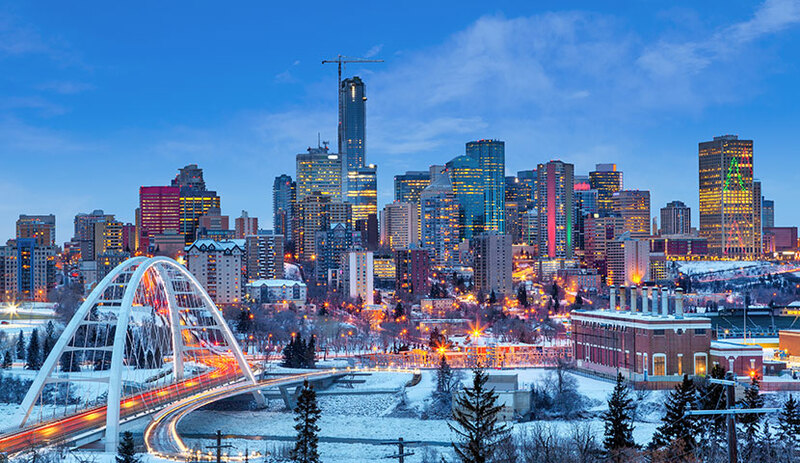 The one-year moving average for total housing starts in the Edmonton Census Metropolitan Area (CMA) was almost three percent lower in Q1 2019 from the previous quarter. The reduction was due to lower single-family housing production in Q1 2019. Total housing starts within the city of Edmonton saw a reduction due to significantly lower single-family housing production. Even though apartment starts within city limits were higher year-over-year in Q1 2019, the pace of construction activity for new housing units will likely be slower in 2019, particularly for a single-family product, as both the existing and new home markets remain well-supplied. However, housing demand is expected to start firming up in the second half of 2019 which should help absorb both existing and new home supply.